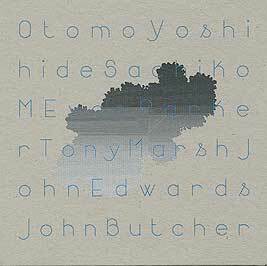 Otomo Yoshihide, guitar (except track 4); Sachiko M, sampler (except track 3); Evan Parker, saxophones (tracks 1, 2); Tony Marsh, drums (tracks 1, 2); John Edwards, double bass (tracks 1, 2); John Butcher, saxophones (except track 1). Recorded on 9 March 2009 at Cafe OTO, London. Design (front cover reproduced above) by Paul Abbott.